5 Weeks to Go!...Wait, only 5 weeks?!?!? Hey guys! Thought we’d just throw a slew of updates at you, since it’s been a while. And somehow, we’re only 5 weeks away from heading out to the East Coast and dipping our wheels in the Atlantic. That little fact is exciting and terrifying in the best of ways. We have scheduled a couple of kick-off parties – one in Indianapolis and one in Washington, D.C.! The Indianapolis one will be in the evening on Saturday, May 25th, likely at a park in the Indy area. It’ll be a casual bbq, no charge to anyone who wants to attend; all we ask is that you RSVP on the Looking Out Across America Facebook page so we can plan accordingly! The party in D.C. will be on the evening of Sunday, June 2nd. Location is still TBD – likely at a bar in the area, so we’ll keep you posted on that. If you can attend, please RSVP on our Facebook page so we know how many to expect! Bring your friends, come on out and have some fun! RSVP as soon as you can – we need to start working with a location very soon in order to have space reserved! $1,000 is nothing to balk at! Hey, that’s $1,000 that might not have made its way to LOF any other way, right? But…I’m pretty sure we can all do better than that! And I’m not exempting the two of us from doing our part and putting our money where our mouths are! We’re going to use that link and donate a bit of cash to LOF via LOAA right now! Finding sponsors is, frankly, hard as hell, and an exercise in accepting rejection. It’s tough to try to expound upon the value that a company may realize from sponsoring a small, 2-person ride across the country, versus the immediate impact they receive from sponsoring a single day road race with hundreds of participants. We haven’t yet given up though! That said – we have received some fantastic discounts on amazing saddles from Brooks England, discounts on backing meals from Backpacker’s Pantry, and a product donation from Gu. We certainly are appreciative of the support offered by these companies! Oh yeah…we did sign up to bike 4,400 miles across the country, didn’t we?!? It’s FINALLY trying to become Spring here in Indiana, so we’re finally starting to be able to get out on our bikes again! We’re going to try to up our mileage every week until we take off, so we have a good base biking fitness built up before we take off (not to mention getting our asses used to sitting on our saddles, ouch!). We only got in about 26 miles last week, so there’s nowhere to go but up! We tried out spin classes for the first time a few weeks ago, and will work those into the mix as well – that’s a good, hard workout in an hour, and it should help increase our cardio fitness in ways that our slow pedaling on heavy bikes on the road right now cannot. Bring on the pain! We’ve had our route and tentative schedule up on the website for a while now, but we spent several hours this weekend actually planning exact campgrounds, hostels, or hotels for our overnights! It feels like we took the trip in our minds, and makes it feel even more real. And we now have a good idea of how much lodging will cost for the 94 or so days we’ll be on the road. Thanks mostly to Kansas and its fantastic plan of letting cyclists camp in its city parks for free, we should be able to keep our lodging to around $1,500 for the entire summer – that’s an average of about $17 a day! To put that in perspective, if we stayed in the cheapest of seedy motels for 94 days, we’d be out about $4,500 – yikes! We likely won’t post our exact overnight plans on the site, for safety’s sake, but about 75% of our total overnights will be spent camping, with another 10% or so spend in hostels or donation-only church or fire department lodging. Can’t wait to see what it feels like to live as minimalists for 90 days! 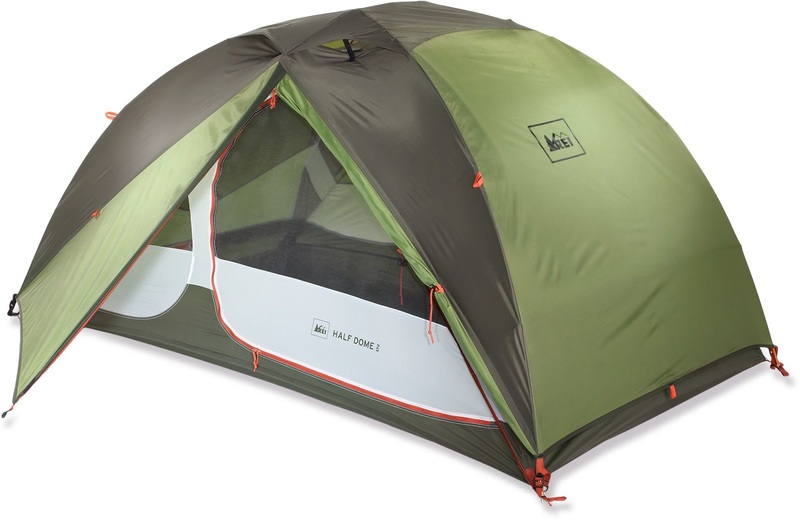 This is our new backpacking tent! We're going to see a lot of it this summer! We still have t-shirts available and in-stock, so if you don’t have yours yet, we’re ready to get one to you! And, Delaware is still shirtless, so if you or anyone you know lives there, help us cover 100% of the states with Looking Out Across America t-shirts! Thanks to all of you for your support, and for still reading these blogs even after we inundate you on Facebook with random updates! Expect more of them to come as the pace of preparation increases as the trip gets closer! Residents of Delaware, Louisiana, and South Dakota - another t-shirt giveaway! Ok DE, LA, and SD - you are the final 3 states without LOAA t-shirts in them! We have another LOAA supporter who has generously donated a t-shirt to give away to one lucky winner in either Delaware, Louisiana, or South Dakota! Size of your choice! This contest will run from today through midnight on Friday, April 19th. Share it with your friends in those states! A few weekends ago, Erica and I decided to take a little road trip down to Kentucky to check out part of the TransAmerica trail that we will be riding on this summer. Even though our adventure is only a mere 8 weeks away, I think we both needed to see something tangible about the road we will be on. Perhaps it was nothing more than a slight introduction for us…to go out onto the actual roads we will be riding on, as a way of saying “Hello” to the path, which will be our constant companion for the days and months ahead. If you’ve ever played a sport, given a speech, played a concert, then you can probably relate to some of the feelings we had about this short trip. In basketball, you can practice a million times on a court…but something about that court feels different on game day. With speaking, you can prepare your words over and over in the space you are speaking at, but it all feels changed in a room full of people. I’m sure musicians feel this shift at venues between sound checks and rehearsals to when they hit the stage…the energy is altered when it is showtime. For us, we’ve imagined, dreamed, anticipated, and prepared for this trip in so many ways and for such a long time, but actually getting to be on the road will be something entirely different. In all of our preparedness for the trip, we have read many books from folks who have also journeyed across the country by bike and they all say the same thing: “Never ask motorists about the roads.” Why? Because driving up and down hills is entirely different than maneuvering a bicycle up and down those same hills. A couple of years ago, I made note of this after Erica and I went on a quick ride to downtown Indianapolis from our home. Downtown Indy is only about 8 miles from where we live. We made the trip into the city pretty quickly, but when we started to head back, I noticed that the ride back felt like a constant uphill climb…turns out it was exactly that. I had never realized this before in my vehicle. There is also something else we enjoyed on this short trip, perhaps a bit by accident…the path we will be on this summer goes right through the Kentucky Bourbon Trail, a section of Kentucky where several bourbon and whiskey distilleries are located. We decided to take the short tour of the Heaven Hill Distillery, where we learned a little about the heritage of an industry that remains so important to the economy of the state of Kentucky. We also knocked back a couple of small glasses of Heaven Hill’s finest products, which were quite enjoyable. Also, we managed to fit in a quick stop at the Abraham Lincoln Birthplace, a National Historic Park located in Hodgenville. We love getting to do this kind of stuff,especially if it involves the National Park system…we are a bit geeky in that way! If there’s one thing I’m especially excited about while we will be on our trip, it will be the opportunity to see those little historical and local treasures that are a part of the various towns and cities along the way. There’s truly nothing like seeing America by bicycle, and at 8 weeks out, I know I can prepare all I want for this adventure, but when it’s showtime I know the journey will provide a new energy, full of surprises. I can’t wait!